Time: 55:20!!! PERSONAL BEST BABY!!! Did you see that finishing time? 55:20! One minute 18 seconds faster than my previous best three weeks ago, which was 37 seconds faster than my previous, previous best, and more than 20 minutes faster than when I first started climbing the Grind six years ago!. So what if I had feelings of upchucking, or had scratched the hell out of my hands, or looked as though I’d taken a nasty fall with all the mud caked on my thighs, or had been eating dirt for the better part of the climb, that time was worth every second of the pain. If I could have screamed through my heaving breaths, I would have. Flopping onto the nearest rock, however, was all I could manage the next best option. I totally look like I’m about to jump for joy don’t I? Totally! It was probably a good day to have a high though, as I was meeting up with the peeps from I Challenge Diabetes, a non-profit organization founded by Olympic rower Chris Jarvis that brings Type 1s together for athletic endeavors. And while none of these people are medical professionals, they are all diabetics, they have all lived this disease, and the information they’ve gleaned through years of trial and error can oftentimes far exceed what a doctor on a tight schedule can give you. Chris and I sharing our diabetes tales. So I was talking to Chris about my BG issues, and he suggested maybe it was stress kicking my blood sugars up. I’m not sure why the Grind would cause me stress as I’ve done it tons of times before, but given the state of my belly every time before taking on the Grind, maybe he’s on to something. But then again, it could also have something to do with the fact that my breakfast was two hours prior and maybe the inactivity was just too long for such a reduced bolus. I’m thinking it might be time to enact a little of my own trial and error. 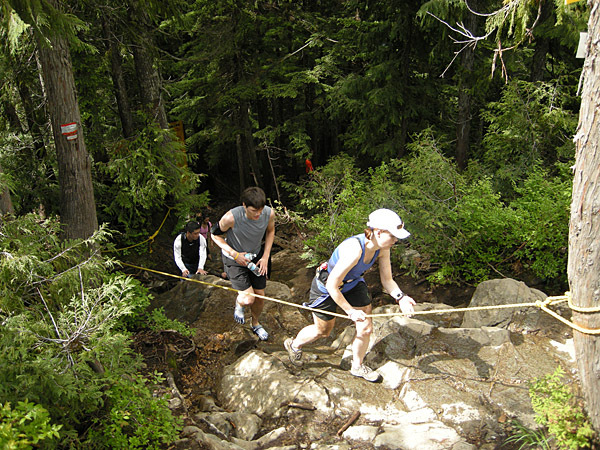 This entry was posted in Diabetes, Training and tagged Chris Jarvis, Grouse Grind, high blood sugars, I Challenge Diabetes. Bookmark the permalink. Congrats on the new PB. Quite impressive! 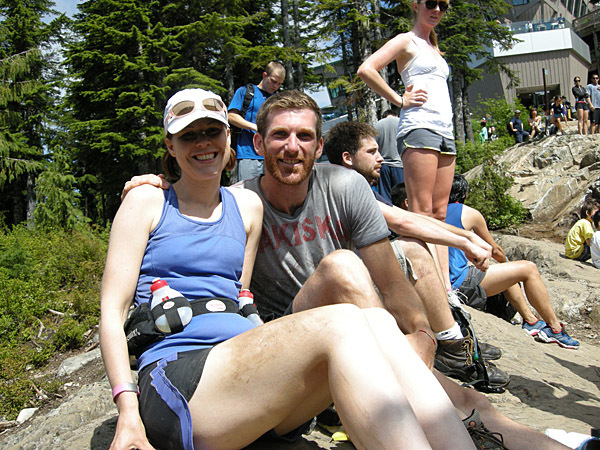 Major congratulations on your awesome time! I’m super jealous that you have something this awesome so close to where you live. It’s too bad that we have to do the whole trial and error thing, but I’ve been journaling my exercise food/BGs/insulin/etc. for the last month (since my crash during the BAA 10K). I’ve noticed so many things and feel like I’m already in a better place. It’s really helped me make decisions before heading out. Good luck!